Jardines Aggressor II is a 41.5 metres long and 7.6 meters wide professional steel dive yacht, Like all Aggressor Fleet's yacht, it was built and maintained to SOLAS shipping standards. It is diesel-powered, cruise at 10 knots and have 110-volt power onboard. Jardines Aggressor II features a roomy, air conditioned salon and dining area, sun deck complete with a hot tub (Jacuzzi), lounge and deck chairs, stereo and CD player (has an IPod plug-in), shaded wet bar and grill, a complete photo center with a digital video and still photo editing computer. The spacious dining area and galley are located on the upper deck, chefs onboard will offer guests delicious meals in various styles from appetizer to dessert all with love. If you have any special dietary requirements, please let our booking agents know, so we can put an note for you. Jardines Aggressor II's beverages selection includes fruit juices, soft drinks, iced water, iced tea, coffee, and a limited selection of local beer and wine, which are complimentary. Due to the high duty charged on liquor, we suggest you bring your special brand from the U.S. or last duty free point. Due to local regulations; the bar will be closed while the boat is in port. Drinking and diving do not mix. Once you consume alcohol, you become a snorkeler until the next day. Diving amenities include Nitrox (must be prepaid), individual dive lockers, camera table with low-pressure air hoses, and two hot, fresh water showers. There is ample storage space for your diving equipment in your personal locker. The stern and platform area is very spacious. The boarding ladders were designed for convenience to allow divers easy entries and exits. 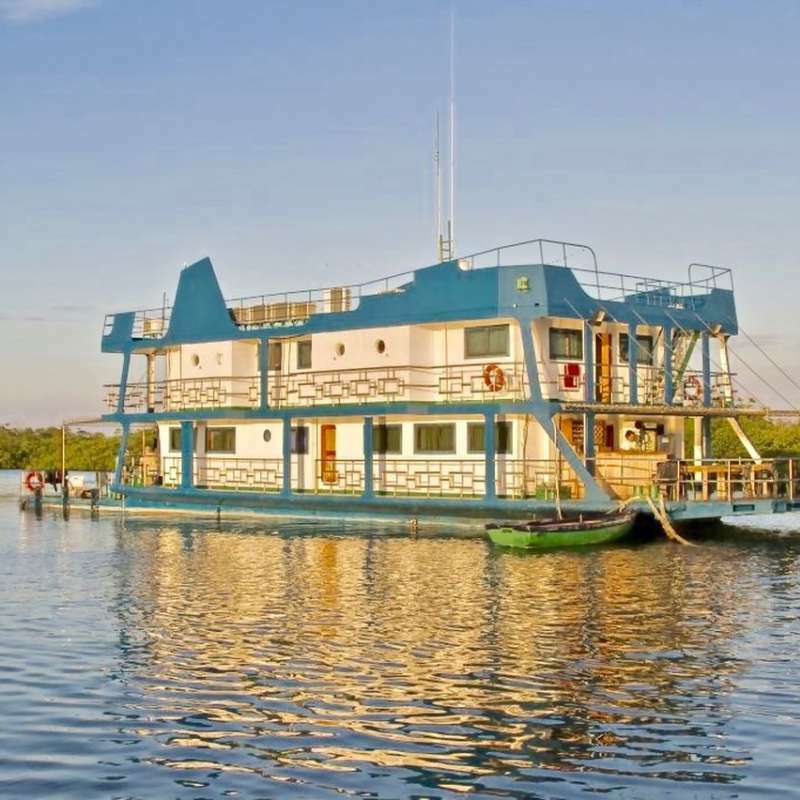 All cabins have air conditioning climate controls, and ensuite bathroom. 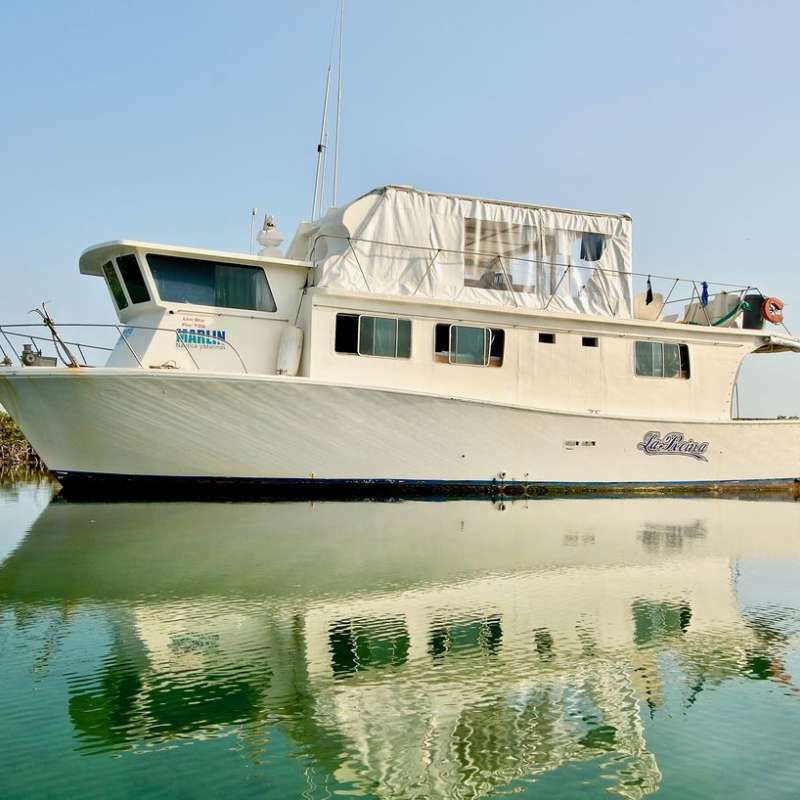 Located on the main deck, each cabin comes with 2 large single beds side by side (38 x 75 inches), that can be made into a king bed (76 x 75 inches), private bathroom, and sliding glass doors to private balcony. Located on the lower deck, each cabin comes with two twin beds (side by side, 38 x 75 inches), private bathroom, these two cabins are larger than other deluxe cabins, but there is no porthole/window. Located on the lower deck, each cabin comes with two twin beds (side by side, 38 x 75 inches), private bathroom and portholes. Located on the lower deck, each cabin comes with two twin beds (side by side, 38 x 75 inches), that can be made into a king bed (76 x 75 inches), private bathroom and portholes. Tortuga est une péniche en acier ancrée dans un canal protégé, de sorte qu'il ne se déplace jamais, comme les hôtels flottants. Quand les clients sont aux Jardins de la Reine, l’hébergement est principalement sur les grandes croisières ou sur l'original péniche double ponts de 33.5 mètres - le Tortuga. Avalon Fleet I est l'un des meilleurs bateaux de luxe à Gardens of the Queen, il propose des croisières de plongée pour les plongeurs du monde entier, pour découvrir le beau et mystérieux monde sous-marin autour de l'île. Avalon Fleet II est l'un des meilleurs bateaux de luxe à Gardens of the Queen, il propose des croisières de plongées pour les plongeurs du monde entier et il vous fera découvrir le merveilleux monde sous-marin de Jardines de la Reina.